A specific pillow for camping, admittedly, isn’t the first thing you think of when you’re going on a camping trip, that is until you experience the feeling of waking up with your face resting on a pile of cold, slightly damp sweaters. A camping pillow provides that grateful layer of insulation from the ground and it is made from polyester rather than cotton, so it’s much more resistant to morning dew than the contents of your rucksack. 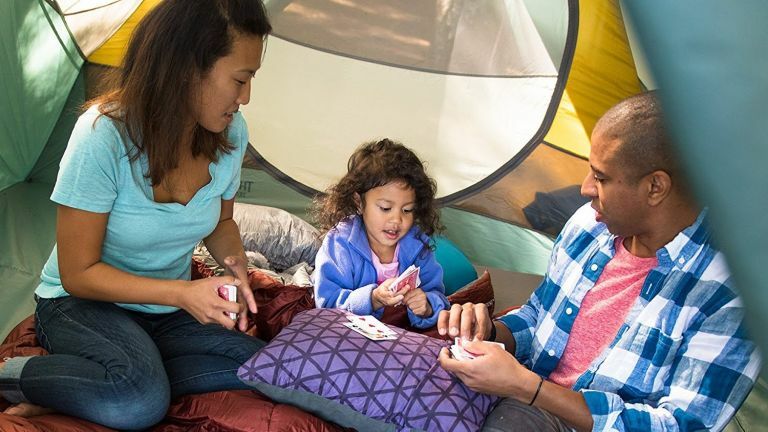 When it comes to camping pillows, Trekmates Deluxe Lightweight Camping Pillow takes the top spot. Like many of the others on our list, it’s lightweight, insulative and soft - the perfect combination for a good night’s sleep, and its price is ideal for the occasional camper, too. Of course, inflatable isn’t your only option. If you don’t quite think it will tick the comfort box, you can always go for a filled pillow, like the Therm-A-Rest Compressible Pillow from Cotswold Outdoor. Style isn’t really an overwhelming factor when it comes to camping pillows, although if you want yours to stand out from the crowd, certainly take a look at YOUR Pillow, our multi-coloured offering from retailer giant Amazon. A camping pillow doesn’t have to be an expense that you have to try and justify, especially when this one is available from Amazon for under a tenner. The key points are that it’s insulating, so a cold head shouldn’t be an issue, and it comes compact in a little bag, ideal for stuffing inside a rucksack. If you’re looking for a camping pillow that cranks up the comfort level, this foam filled number is the best. Although not the lightest, it compacts down to one fifth of its size, which makes it handy to stuff inside a rucksack or hand luggage if you’re catching a flight. The foam inside the pillow self inflates to provide that extra bit of cushioning and the exterior is super soft. Weighing in at just 60g, this supportive pillow is perfect for those that have a long trek ahead of them. With curved central baffles to provide a good level of head support and scalloped bottom centres to position the pillow over your back and shoulders, it provides that extra level of comfort for the best night's sleep. Thanks to its portability, it’s also ideal for taking on holiday as a headrest for sun loungers. There are two factors here that make it the ideal choice for festival goers. One: that it’s bright, lairy and stands out from the crowd. Two: it’s self inflating, so you don’t need to waste valuable drinking time blowing it up. Like the other pillows in this list, it features a soft polyester surface for resting your head and it comes in a handy carry bag for easy portability. If you’re road tripping to your campsite, you can be the envy of everyone else in the car with this travel pillow. While its J shape may seem out of the ordinary, this travel pillow supports your chin in addition to the rest of your head, which should eliminate that crooked neck feeling when you fall asleep in an awkward position.